Republican candidate Mitt Romney has criticised surging rival Newt Gingrich for saying he is on course to win the party's presidential nomination. In a swipe at Mr Gingrich's record, Mr Romney told Fox News that the US does not need "better lobbyists, or better deal-makers, better insiders". His comments come on the day he launched attack ads against Mr Gingrich in Iowa, a key election state. On Thursday, Mr Gingrich told ABC News he would win the race. "It's very hard not to look at the recent polls and think that the odds are very high I'm going to be the nominee," Mr Gingrich said. The former speaker of the House of Representatives has soared in the polls in recent weeks and has overtaken Mr Romney in a number of early-voting states. Meanwhile, onetime conservative darling Herman Cain is returning to Atlanta, Georgia, to discuss the future of his campaign with his wife Gloria. Are Republicans ready for a crisis in Europe? Facing allegations by a 46-year-old woman, Ginger White, of a 13-year-long extramarital affair, Mr Cain has said he is "reassessing" his campaign amid plunging poll ratings. Mr Cain is expected to announce on Saturday in Atlanta, Georgia, whether he will continue in the race. 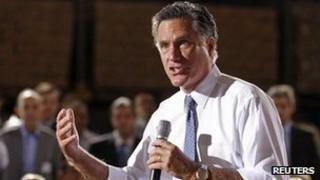 Speaking out on Friday, Mr Romney sought to regain the initiative after a series of poor poll results. "I must admit that Newt has had a very extensive, long record of working in Washington with various governmental and non-governmental agencies, and I just don't think that's the background that's ideally suited, one, to replace [US President] Barack Obama, and number two, to lead the country," Mr Romney told Fox News. He also said that he disagreed with Mr Gingrich's assertion that he would win the nomination. "Let me tell you, over the last year, [there have] been a lot of people that have been real high in the polls that are not high in the polls anymore," said Mr Romney. "I'm confident that this will be a successful campaign. Self-aggrandising statements about polls are not going to win elections," he added. The comments are some of the most critical the former Massachusetts governor has made about his fellow contenders for the Republican nomination. Mr Gingrich has jumped in recent opinion polls to the front of the pack, while Mr Cain's ratings have fallen. At the same time he has faced questions over his past ties to the federal mortgage lender, Freddie Mac, from whom he is said to have received up to $1.8m (£1.1m) in fees. It is also reported that an organisation he founded, the Center for Health Transformation, made around $37m in eight years from the healthcare industry. The think tank reportedly advocated for health insurance mandates that are now strongly opposed by many Republicans. One poll released on Thursday by Rasmussen Reports shows Mr Gingrich leading the Republican pack by 21 points. In Iowa, where the first nominating contest is just five weeks away, polls by Rasmussen and Insider Advantage indicate that Mr Gingrich is leading with a double-digit margin. Mr Romney has begun ramping up his campaign presence in Iowa, where support for religious conservatives has traditionally been strong, even though this group has not been a core demographic for his campaign. However, along with the TV commercials, Mr Romney has also opened a campaign office in Des Moines. In the 2008 elections, when Mr Romney ran a failed bid for the Republican nomination, he invested $10m in Iowa, although he did not eventually win the state caucus.